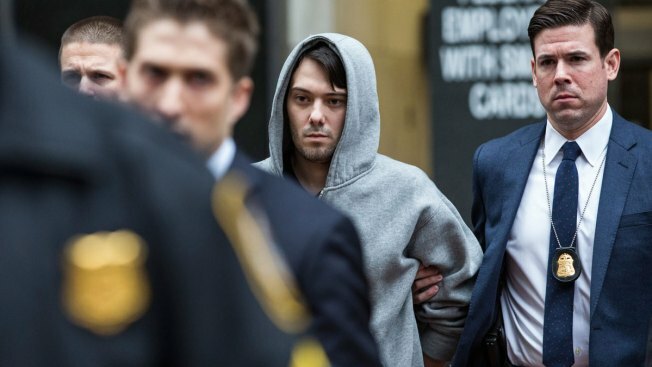 Martin Shkreli (C), CEO of Turing Pharmaceutical, is brought out of 26 Federal Plaza by law enforcement officials after being arrested for securities fraud on Dec. 17, 2015 in New York City. The pharmaceutical executive reviled for price-gouging resigned Friday as head of the drugmaker Turing Pharmaceuticals, a day after being arrested in New York on charges of securities fraud related to a company he previously ran. Martin Shkreli, whose arrest delighted countless people appalled by his unapologetic stance after hiking the price of a life-saving drug by 5,000 percent, is being replaced on an interim basis by Ron Tilles, according to a statement issued Friday by Turing, which is privately held. Tilles has been chairman of Turing's board of directors since the company was founded late last year. Turing said that Tilles will continue to hold the board chairman position as well. He has worked at numerous private equity and venture capital firms in the pharmaceutical and medical device industries over the last two decades. Turing also issued a statement that business would continue as usual and that no patient would be denied access to Daraprim, the drug whose price hike made Shkreli a pariah to both patients and other pharmaceutical companies. Martin Shkreli, the former hedge fund manager vilified in nearly every corner of America for buying a pharmaceutical company and jacking up the price of a life-saving drug more than fiftyfold, was arrested Thursday on securities fraud charges unrelated to the furor. Jonathan Dienst reports. Turing also said it was sending a similarly worded letter to doctors stressing that it will continue to offer financial assistance to eligible patients needing Daraprim who are either uninsured or have commercial insurance. Medicare patients are being referred to a charity for help. Shkreli, a 32-year-old former hedge fund manager, has become the "most hated man in America," according to some headline writers, for jacking up the price of Daraprim, the only approved drug for toxoplasmosis, a life-threatening parasitic infection that mainly strikes pregnant women, cancer patients and AIDS patients, from $13.50 to $750 per pill. He did so this fall, shortly after Turing acquired rights to sell the pill in the U.S., paying another company $55 million for it. Amid a deluge of criticism from patients and politicians, Shkreli pledged to lower Daraprim's price, but later reneged and instead offered hospitals a 50 percent discount — still amounting to a 2,500 percent increase. Patients normally take most of the weeks' long treatment after returning home, so they and their insurer still face the $750-a-pill price. On Thursday, federal prosecutors said that between 2009 and 2014, Shkreli lost some of his hedge fund investors' money through bad trades, then looted Retrophin, a pharmaceutical company where he was CEO, for $11 million to pay back his disgruntled clients. Shkreli founded the company early in 2011 and was sued by Retrophin and fired last fall after his alleged misappropriations were revealed. Shkreli, a flagrant self-promoter who recently said he should have hiked the price of Daraprim even more, was paraded in handcuffs by the FBI after his arrest. Photos of him, wearing a gray hoodie as he was escorted by authorities, spread on the Internet like wildfire, generating social media posts celebrating his apparent fall. The news — unrelated to his actions at Turing — delighted patients, advocacy groups and average Joes who found his price-gouging despicable. Shkreli pleaded not guilty to charges of securities fraud and conspiracy, which carry a sentence of up to 20 years in prison if he's convicted. He was released on $5 million bail. He later posted on his Twitter account: "Glad to be home. Thanks for the support." Turing, which has offices in New York and Zug, Switzerland, said Tilles has worked with several securities firms, starting with Merrill Lynch in 1985. 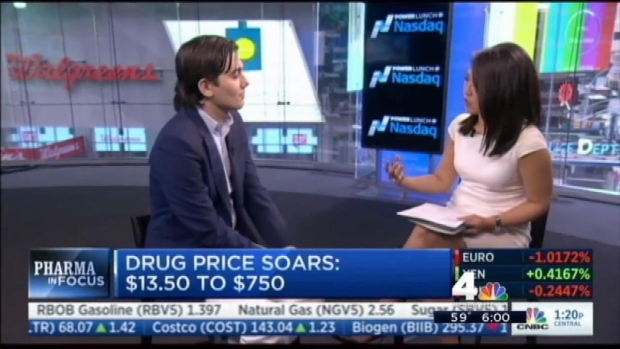 In the company's statement, Tilles said he's excited by the chance to guide Turing and that it's "committed to ensuring that all patients have ready and affordable access to Daraprim" and a second drug, Vecamyl, a pill for treating high blood pressure. Tilles also thanked Shkreli "for helping us build Turing Pharmaceuticals into the dynamic research-focused company it is today," a reference to Shkreli's after-the-fact claim that he needed to raise Daraprim's price so much to fund research on other drugs. Shkreli recently became the CEO of a second company, KaloBios Pharmaceuticals, Inc., based in South San Francisco, California. There's no word yet on whether he'll remain at the helm there. KaloBios had announced plans to stop research programs on two drugs and shut down the company shortly before Shkreli and an invested group swooped in on Nov. 19, bought 70 percent of its shares and promised a $3 million stock investment and $10 million in financing. Shkreli was named CEO and board chairman the same day, and KaloBios shares zoomed from $2.07 to $39.50 within days. Trading in KaloBios shares was halted early Thursday,after Shkreli's arrest, and hasn't resumed. Their price fell to $23.59 .